The emergence of the notion of a circular economy follows an awareness of the planet's limited resources and the need to save them. The emergence of the notion of a circular economy follows an awareness of the planet's limited resources and the need to save them. This concept also includes the idea that new production and consumption patterns linked to the circular economy can generate sustainable and non-delocalizable activities and job creation. The circular economy is part of the green economy field. Thus, the challenges of the circular economy are environmental, economic and social. 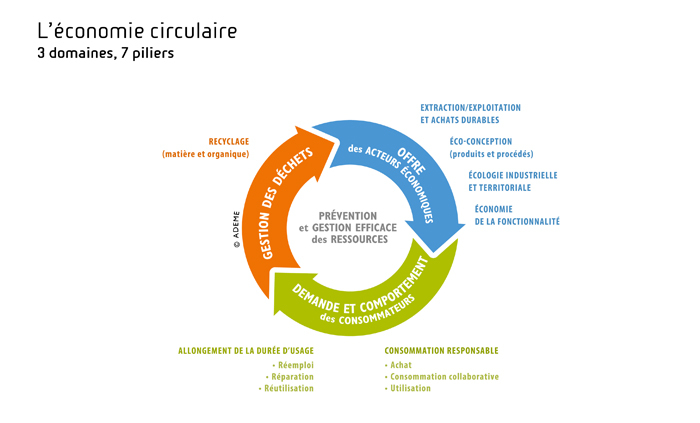 In France, the transition to a circular economy is officially recognized as one of the objectives of the energy and ecological transition and as one of the commitments to sustainable development. Sustainable procurement: take into account the environmental and social impacts of the resources used, in particular those associated with their extraction and exploitation. Eco-design: taking into account environmental impacts over the entire life cycle of a product and integrating them from the design stage. Industrial and territorial ecology: to create synergy and pool the flows of materials, energy, water, infrastructure, goods and services between several economic actors in order to optimize the use of resources in a territory. The economy of functionality: to privilege use over possession, to sell a service rather than a good. Responsible consumption: take into account environmental and social impacts at all stages of the product's life cycle in purchasing choices, whether the buyer is public or private. The extension of the useful life of products through the use of second-hand repair, sale or purchase, donation, reuse and reuse. Improving waste prevention, management and recycling, including re-injecting and reusing waste materials into the economic cycle. Circular economy The circular economy aims to change paradigm in relation to the so-called linear economy, by limiting resource waste and environmental impact, and increasing efficiency at all stages of the product economy. Following the industrial revolution, the 20th century saw the development of a consumer society that significantly increased its use of natural resources by a factor of 10. The work of the United Nations Environment Programme (UNEP) and other organizations shows that, through a combination of population development, consumption growth in developed countries and emerging countries' desire for a similar consumption pattern, the level of consumption of natural resources will be unacceptable before the middle of this century. The circular economy focuses on the sober and efficient management of resources. The future will therefore lead to a profound transformation of organizations (both local and modal) and lifestyles. The year 2017 was rich with the launch by the Minister of Ecological and Solidarity Transition of a roadmap to put in place the operational tools to move from a linear economic model to a model based on the life cycle of the product as a resource. The model of the developed countries consisting mainly of extracting, producing, consuming and throwing away no longer makes it possible to apprehend a reasonable future on this model. We need to move to a model that focuses on avoiding waste and increasing the intensity of resource use while reducing environmental impacts. Waste management with the priority use of recycling as a means of closing the loop. According to ADEME, the circular economy can be defined as an economic system of exchange and production which, at all stages of the life cycle of products (goods and services), aims to increase the efficiency of resource use and reduce the impact on the environment while developing the well-being of individuals (see technical sheet below). The transition to a more circular economy implies environmental gains but also sectoral reallocations of employment between activities that are intensive in terms of materials and those that contribute to their saving ("eco-activities"), which is why it is interesting to measure the employment content of these activities to assess the extent of the transformation at work. The analysis note "L'économie circulaire, combien d'emplois?